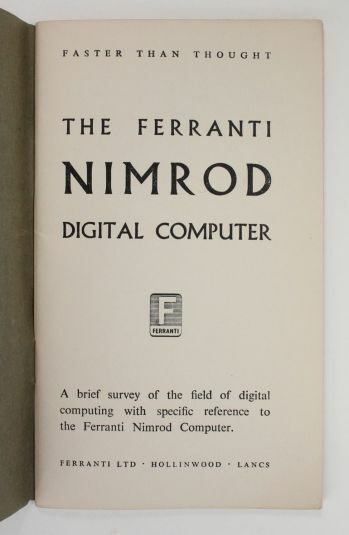 Home / Books / Design / “Faster than Thought”: The Ferranti Nimrod Digital Computer. (Hollinwood, Lancashire): Ferranti Ltd. 1951. First edition. 12mo. 40 pages. Computer manual. 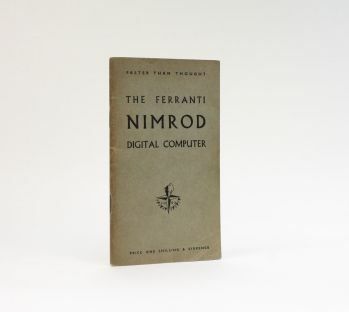 Revealed to the public as part of the Science Exhibition at the Festival of Britain in 1951, the Ferranti Nimrod Computer was the first ever computer game – a machine built exclusively for the purpose of playing a computerized version of the logical game of 'Nim'. Nimrod could play all the variations of the game and, at the exhibition members of the public were invited to play against the machine; at the end of each game the computer would flash up the message “COMPUTER WINS” or “COMPUTER LOSES”. When the famous British scientist and ENIGMA code-breaker Alan Turing played it he managed to beat the computer, although witnesses were amused by a malfunction whereby Nimrod 'changed its mind' from “COMPUTER LOSES” to “COMPUTER WINS” and refused to stop flashing. The booklet provides a detailed guide to the machine, and how it plays the Nim game, it is preceded by a more general introductionto the emergent sciences of computing and artificial intelligence. As an indication of how early the, (computing), language is, it could be noted that the term 'memory' is mentioned only as an alternative to the preferred term 'storage'. This is a fine copy in printed wrappers with the original Science Exhibition Festival of Britain bookmark loosely laid in. Exceedingly scarce, OCLC locates a single copy in the U.S. and the volume is not listed by Hook and Norman in The Origins of Cyberspace their compilation of the most exhaustive bibliography of computer literature.